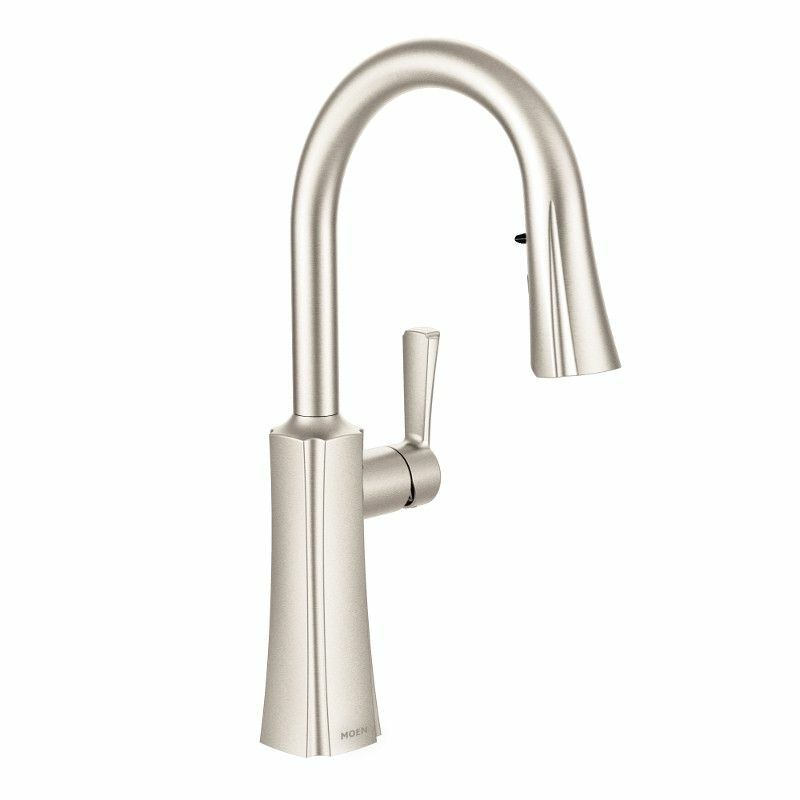 Etch Single-Handle High Arc Pulldown Kitchen Faucet In Spot Resist Stainless Graceful in stature, Etch faucets elevate the look of your transitional kitchen while showcasing several of MOEN's top innovative features. Etch utilizes Reflex technology, engineered specifically for pull-out and pull-down movement by undocking easily, moving with you and retracting effortlessly when you're done. Also designed with Power Clean technology that delivers 50% more spray power than faucets without Power Clean, Etch ensures efficient washing with less effort. For added convenience, MOEN's exclusive Spot Resist finish resists fingerprints and water spots to maintain its original brilliance and easily wipes clean, ensuring the beautiful stainless appearance will continue to shine over time. Etch Single-Handle High Arc Pulldown Kitchen Faucet In Spot Resist Stainless is rated 5.0 out of 5 by 8. Rated 5 out of 5 by amaribo from Functional and beautiful I chose this faucet for my kitchen renovation and it was installed about a month ago. I trust the Moen name, and really like the simple classic lines of this faucet. It looks great with the new stainless steel apronfront sink and the brushed finish looks clean and new all the time. The pulldown feature is simple and efficient, and retracts cleanly to hide behind the slightly belled spout. Swivels easily. Rated 5 out of 5 by DJF6277 from MOEN STAINLESS STEEL PULL DOWN SPRAYER REFLEX FAUCET This faucet, as the other MOEN faucet it replaced, meets the expectations of the owner. Rated 5 out of 5 by Callen from Great faucet Installation was by a professional. We have used the new faucet for at least a month and we love it! Why didn't we upgrade earlier? It is easy to turn on and off. It swivels 360 degrees and the sprayer is very convenient and retracts by itself.